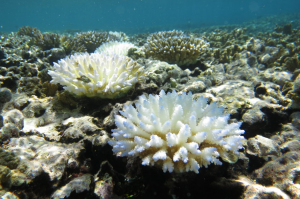 Welcome to the third and final blog post tracking the progress of the Marshall Islands during a season of dramatic coral bleaching. In the last post, I discussed the status of different coral species on specific atolls in the Marshall Islands. This post will attempt to address the potential future trajectories of the coral reefs surrounding the Marshall Islands. 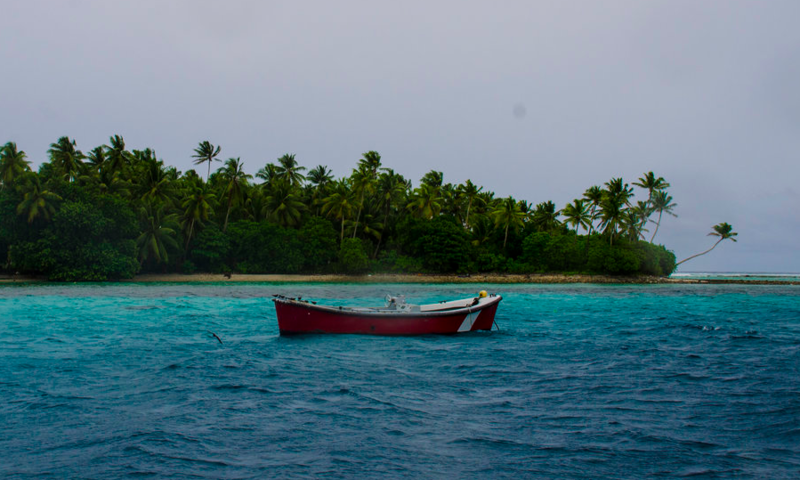 Figure 1: A boat is moored in the lagoon at Majuro atoll in the Marshall Islands. As time goes on and climate change advances, coral bleaching events will grow more frequent and severe . How coral reefs are able to survive and recover from these events has some dependence on how humans will manage our relationship with nature in the future. It is more important than ever to quantify environmental disturbances and re-evaluate how we protect coral reefs . There are several solutions that exist to help protect the reefs. In some more inhabited areas of the Marshall Islands, runoff and other ocean-altering practices can be more closely regulated to help reduce pressure on coral reefs. In other areas, removal of herbivorous fish can be regulated and reduced in order to balance algal growth on reefs . Figure 2: An example of a bleached coral in the Marshall Islands, photographed in 2014. Although this blog focuses on the reefs of the islands, the human populations in the Marshall Islands are also experiencing stresses due to climate change. These are the people who can directly impact and help reef life, so it is important to discuss life on land as well. Earlier last month, the Marshall Islands were declared to be in a state of emergency. What are being called “king tides” have swept in and inundated the atolls in unusual and unprecedented amounts, forced over 1,000 people to evacuate and relocate to other atolls . On average, the Marshall Islands are only 2 meters above sea level, making them very susceptible to flooding, but officials say that the amount is unusual, and in some placed, the sea has even reached the pools in the center of the atolls . This loss of shoreline is very distressing, and will continue to be watched in the coming months and years. This video is from the 2014 king tides, and it is shocking to think that the events have continued to worsen. However, it is not all bad news. Late last month, the Marshall Islands became the third nation (following Fiji and Palau, two other nations that have been similarly impacted by climate change) to formally ratify the global carbon-cutting climate agreement made in Paris . Hopefully, resolutions like this one will help improve carbon output and slow the progress of climate change and ocean acidification. It is difficult to monetize coral reefs. They affect biodiversity, ocean health, and food security for dependent populations. Moving forward, it is of the utmost importance that we be responsible in our consumption of ocean products our production of carbon so that we can keep this flagship ecosystem around for years to come. Sheppard, Charles. “The Biology of Coral Reefs”. Oxford University Press. 2009. Pgs. 239-242; 289; 267. “Marshall Islands face evacuations as sea swamps capital”. http://www.climatechangenews.com/2014/03/04/marshall-islands-face-evacuations-as-sea-swamps-capital/. 3/04/2016. “Marshall Islands to ratify Paris climate agreement”. http://www.climatechangenews.com/2016/03/21/marshall-islands-set-to-ratify-paris-climate-agreement/. 3/21/16. This entry was posted in Uncategorized and tagged 2016, Climate Change, coral bleaching, Hanna, Marshall Islands, Ocean Acidification. Bookmark the permalink.